British Netflix might not have as many titles as its American counterpart, but Netflix UK has several movies and TV shows not available to Netflix subscribers in other parts of the world. In this article, we’ll show you how to get British Netflix in any country and recommend some of the best VPNs for Netflix UK. A VPN, or Virtual Private Network, encrypts all of the internet traffic from a device and routes it through an intermediary server in a location of your choosing. By connecting to a VPN server in the UK, for example, you can unblock the Netflix UK catalog of shows. Note that even if a VPN provider can unblock Netflix, it’s possible that only a small subset of servers can do so. For this reason, we recommend you contact your VPN provider’s customer support to ask which is the best VPN server for watching British Netflix from abroad. Furthermore, we have only tested these VPNs with Netflix UK in a desktop web browser. We cannot vouch for whether or not they work with the Netflix apps for Android, iOS, and media consoles. ExpressVPN unblocks Netflix UK, as well as Netflix US and Netflix Canada. Not all servers work with Netflix, but a quick chat with ExpressVPN’s live customer support will point you in the right direction. ExpressVPN has been a reliable Netflix unblocker since Netflix began blocking VPN users in 2016. Likewise, it can get past similar geo-locks on Amazon Prime Video, HBO Go/Now, Sky Go, and BBC iPlayer, among others. 256-bit AES encryption is paired with perfect forward secrecy to keep your browsing private. A kill switch—called a « network lock » in ExpressVPN parlance—and leak protection ensure no internet traffic escapes the VPN tunnel. Every server is optimized for fast speed, which means you can usually watch in HD without buffering. ExpressVPN apps are available for Windows, MacOS, iOS, Android, Linux, and certain wifi routers. A router VPN is a good option for those who like to watch on media streaming devices, smart TVs, and game consoles that don’t natively support VPNs. Every ExpressVPN subscription comes with MediaStreamer, a smart DNS proxy service that can be used independently of the VPN to unblock Netflix and other streaming channels. TRY IT RISK-FREE: Get 3 months free here with ExpressVPN’s annual plan. The deal includes a 30-day no-quibbles money-back guarantee, so you’ll receive a full refund if unsatisfied. NordVPN unblocks Netflix in several countries including the UK, US, France, India, the Netherlands, Spain, and possibly others that we haven’t tested yet. To find out which servers work with Netflix, you can search NordVPN’s knowledge base or shoot a message to the live customer support. NordVPN also unblocks a long list of other streaming services including Hulu, Amazon Prime Video, Sky Go, and BBC iPlayer. Speeds are usually sufficient to stream high quality video without buffering. NordVPN protects your data with 256-bit AES encryption and perfect forward secrecy. The company keeps no logs whatsoever of users’ activity. Leak protection and a process-specific kill switch ensure your data never escapes the VPN tunnel. NordVPN operates over 3,500 servers in more than 60 countries. You may connect six simultaneous devices on any plan. Apps are available for Windows, MacOS, iOS, and Android. DISCOUNTED DEAL: Save 77% on Nord VPN’s three-year deal here. PrivateVPN unblocks British Netflix, and the servers are clearly labeled as such so you won’t have to search the website or ask customer service. This VPN also unblocks Netflix US, Spain, Japan, Brazil, France, and Italy—pretty much everywhere that we’ve tested up to this point. Despite its relative youth and small server network compared to others on this list, PrivateVPN easily bypasses geo-locks on Amazon Prime Video, Hulu, Sky Go, and BBC iPlayer as well. Fewer servers doesn’t mean slower speeds in this case, as PrivateVPN excels at streaming HD video without buffering. You’ll also get all of the privacy and security features you would expect of a veteran VPN provider, including a kill switch, DNS leak protection, and a zero logs policy. Choose between 128-bit or 256-bit AES encryption, both of which are more than sufficient to protect your data. You can connect up to five devices at once. Apps are available for Windows, MacOS, iOS, and Android. READER DISCOUNT: Comparitech readers can save over 70% on PrivateVPN’s annual plan, plus get 5 months extra free. Read our full PrivateVPN review. VyprVPN unblocks Netflix UK, US, and Japan. This veteran provider owns and operates many of the servers on its network, ensuring fast download speeds for seamless video streaming in high quality. VyprVPN can also unblock Hulu, HBO, and Sky Go, according to our latest battery of tests. Not all servers work for unblocking, but you can simply chat with a live customer service agent to find out which ones to connect to. VyprVPN does not log the contents of any web traffic while you’re connected, although some customers might be concerned that the service does record your real IP address for 30 days. VyprVPN uses 256-bit encryption, a kill switch, and DNS leak protection to keep your data safe. The basic tier allows three simultaneous connections, and the premium tier allows five. Apps are available for Windows, MacOS, iOS, and Android. TRY IT: You can try VyprVPN with a 30-day money-back guarantee here. Read our full VyprVPN review. SaferVPN unblocks UK and US Netflix. Just open the app and choose the server that says « UK Streaming » to bypass the firewall. SaferVPN also makes it easy to unblock Amazon Prime Video, Sky Go, and BBC iPlayer. Thanks to the simple and intuitive interface, there’s no need to consult the website or customer service to figure out which servers are working with Netflix. If you encounter any issues, however, 24/7 live chat support is ready to help. Fast download speeds and reliable connections guarantee uninterrupted HD streaming. The company keeps no logs of user activity and uses 256-bit AES encryption by default. Full DNS leak protection and a kill switch prevent any data from being sent outside the encrypted VPN tunnel. The basic « personal » plan allows up to five simultaneous connections. Apps are available for Windows, MacOS, iOS, and Android. READER DEAL: Save 63% on SaferVPN’s 2 year plan. It also includes a 30 day money back guarantee, so you can try it risk-free. Read our full SaferVPN review. Can I use a free VPN for Netflix UK? We recommend avoiding any so-called free VPN services for Netflix UK. Free VPNs generally don’t have the resources to outmaneuver Netflix’s anti-VPN tactics. They also carry certain risks and limitations that reputable paid VPNs abstain from. If you attempt to use a free VPN for Netflix UK, you’ll almost certainly encounter the dreaded proxy error and won’t be able to view the video. Many free VPN services impose data caps or bandwidth limits that hinder bandwidth-intensive activities like video streaming. Server selections are severely limited and you might have to wait in a queue before connecting. Even if a VPN service advertises itself as free, it has to make money somehow; these are not charitable operations. A provider of a free service may resort to placing tracking libraries on your device, monitoring your behavior, and selling the data to advertisers. Some free VPNs inject advertisements straight into your browser, and a few even carry malware payloads. In short, pay a few extra bucks and get the peace of mind that comes with a good VPN. Netflix imposed the VPN ban in 2016 shortly after its global rollout. Due to content licensing restrictions on TV shows and movies, Netflix is obligated to limit viewership to specific countries, even if doing so is not in the best interests of its customers or Netflix itself. VPNs are 100 percent legal in almost all countries. What’s exclusive to UK Netflix? Besides TV shows, Netflix UK has a ton of movies not available stateside. Netflix’s American catalog of movies has actually shrunk in the past few years as the company diverts its resources to acquiring more TV shows and original content. The licenses to stream those movies are presumably much cheaper in the UK, which means older movies and classics are still in the UK archive. Bollywood fans will also find a lot to love in the UK version of Netflix. The foreign films section of Netflix UK has swelled with Bollywood titles, both old and new. 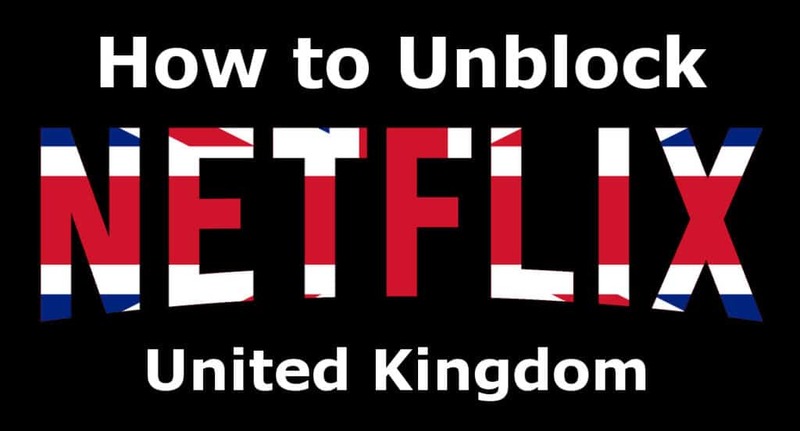 Check with your provider to ask which servers unblock Netflix UK. Chances are that not all servers can bypass the firewall. Log out of any Google accounts, including the one on Chrome browser. Google caches IP addresses and can reveal your real location to Netflix. Disable your GPS and all other location-based services in your device and browser. If you’ve allowed Netflix to see your location in the past, disable this permission in your browser settings. Clear browser cookies, cache, and temporary files. See our tutorials on how to clear your cookies and clear the browser cache on each of the major operating systems. Disable IPv6. This is mainly for Windows 10 users, but it might cause issues on other operating systems. In Windows 10, you can disable IPv6 in your wifi properties. Adjust the device’s timezone to the country where you’re trying to watch Netflix. The UK’s time zone is UTC+0 in the summer and UTC+1 in the winter. If you’re connected to a wifi network and can access the wifi router, rename the wifi network, or SSID. Append “_nomap” to the end of the network name (minus quotation marks). This will opt out of Google’s geolocation services, which use wifi networks to help pinpoint people’s whereabouts. You must reconnect your device to the renamed network. Disconnect and reconnect to the same server location to see if you can get a different IP address that isn’t blacklisted by Netflix.